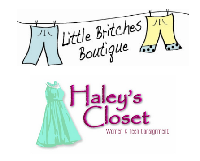 Little Britches Boutique and Haley's Closet are now one store with Consigned Items for boys ages Newborn to 14. For girls we carry Newborn all the way through Junior Sizes....as well as Women's. We carry clothes (seasonal), shoes, purses, accessories, toys, baby equipment, strollers, and lots more. We also carry maternity clothes. We have THE BEST CONSIGNORS!! They bring in wonderful clothes from basics to designer. You can always find what you need at GREAT prices! We always have $3 and 1$ clearance racks. We also carry many NEW LINES including Candy, Rustic Point sauces & dips, Debeeze Honey, Woodwick Candles, TY, Grandmas Secret Spot Remover, SnowStopper Gloves, Mittens, and Alpaca Socks, and more.... Stop by Little Britches for your birthday gift, baby shower gift, etc.